Albion boss Chris Hughton believes his side’s form at the Amex will be key for the rest of the season – starting with tomorrow’s top-of-the-table clash with Middlesbrough. 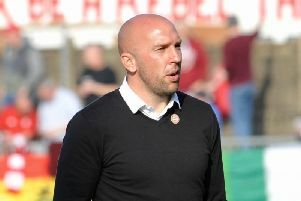 The Seagulls, who are now unbeaten in 21 league matches this season, sit second in the Championship – on goal difference – behind leaders Middlesbrough. With eight wins and two draws from their ten home matches this season, Hughton knows how important his side’s home form will be for the rest of the campaign as they look to remain in the hunt for promotion. He said: “Our home form will be massively important. “There might be the odd one or two teams that fare better away from home but the majority of teams are always going to feel more comfortable at home, and will get the majority of their points there. “We would be no different. There are an awful lot of real tough away days in this division. You’ve always got to try to make the most of your home form. Lewis Dunk will miss the game through suspension after being sent-off at Queens Park Rangers. Winger Solly March has been ruled out for the rest of the season with the knee injury he sustained at Derby but Albion have no other fresh injury worries.